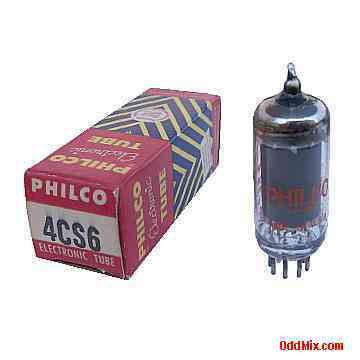 This is a genuine, vintage Philco 4CS6 Pentagrid electronic tube in it's original box. A collector's special vacuum tube. This tube was developed for gated amplifier in early television receivers. Naturally a vacuum tube with a heater-cathode and five grids can be used for many other special purpose circuits like oscillators and RF amplifiers. Useful for those antique radio restoration projects, experimentation, circuit research or to set up a private vacuum tube museum. It is new, unused, boxed, excellent condition. First come first serve, only one of this rare historical vacuum tube available!